BEAUTIFULLY PRESENTED, THEY ARE AN IDEAL PRESENT OR A BRILLIANT ADDITION FOR YOUR OWN COLLECTION. EVERY STAMP ISSUE OR M/SHEET (WHERE APPLICABLE) ISSUED IN THAT YEAR IS DESCRIBED AND EXPLAINED IN GREAT DETAILS. 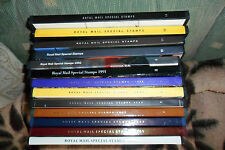 GB Royal Mail Special Stamps 2012 Year Book 29 Complete With All Stamps. GB 1995 Royal Mail Special Stamps Year Book no 12 complete with stamps put into the protective film on pages. In great condition. See photographs. Dispatched with Royal Mail. 50 YEARS OF DR WHO (DY6) COMPLETE, AS ISSUED. GREAT BRITAIN PRESTIGE BOOK. Alternatively, just ask us for a total invoice! FACE VALUE IS £14.26. ROYAL MAIL 2001 SPECIAL STAMPS YEAR BOOK NUMBER 18. NOT ALL STAMPS ARE SHOWN IN PICTURES BUT THE ALBUM IS COMPLETE WITH ALL THE UNMOUNTED MINT STAMPS , OUTER SLEEVE AND STAMPS ARE IN A MINT CONDITION. PLEASE VIEW MY OTHER ITEMS. ROYAL MAIL 2004 SPECIAL STAMPS YEAR BOOK NUMBER 21. NOT ALL STAMPS ARE SHOWN IN PICTURES BUT THE ALBUM IS COMPLETE WITH ALL THE UNMOUNTED MINT STAMPS , OUTER SLEEVE AND STAMPS ARE IN A MINT CONDITION. THIS BOOK IS NUMBER 25559 OF A LIMITED 30,000 COPIES . PLEASE VIEW MY OTHER ITEMS. SEALED IN CELLOPHANE OUTER COVER.